Thomas F. Rogers founded the Ravenna Times & PrintShop February 10, 1888, with a hand-fed press and handset type. As editor and publisher, he printed the inaugural issue of The Ravenna Times on cloth by hand, which is still a prized possession of the company. A foot-powered hand-fed Gordon Press (on display in the company museum) printed the first commercial jobs. His community involvement led him to serve in the Michigan House of Representatives in 1916. 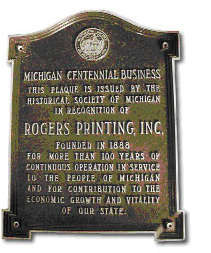 Although, only fourteen, Ralph B. Rogers began his printing and newspaper publishing apprenticeship in 1908. By 1923, augmenting practical wisdom with academic learning, he earned a degree from Northwestern University in Commerce and Journalism. Resigning from R.R. Donnelly & Company in 1936, he rejoined the Ravenna Times that Myrta Rogers had run since 1934; and quickly adapted to a changed business world. Through innovation, he improved Rogers' capabilities with a new Linotype, Kluge automatic feed letterpress, and a Lee newspaper press. In 1961, Ralph B. Rogers, Jr. the third family generation assumed management of the business and switched the printing process to offset. In 1966 the first web press was installed, followed in 1973 by a commercial non-heatset web press. In September of 1976 the last issue of the Ravenna times was printed, ending an 88 year span of publishing. Evolving into heatset web printing in 1981 the company continues to be an industry leader in the use of manufacturing technologies. Thomas B. Rogers, fourth generation and current President/CEO since January, 1996, joined Rogers Printing in June, 1981 and management team in May, 1988. Our heritage of unceasing commitment to service assures you that your needs are our first priority. © 2010 Rogers Printing Inc.